Right off the plane early Monday morning, the students of Write on for Israel literally hit the ground running. After a hike exploring the roots of the Jewish people and a tour of the Rabin institute, the students had the honor and privilege of hearing from Lt. Colonel Peter Lerner, head spokesman for the IDF. Lerner is tasked with speaking to the three primary audiences for the IDF: The Israeli people worried about their children and siblings, an international community which is eager to hear about the actions and concerns of the IDF, and the Arab world best critical of the actions of the army. Read the full article at The NY Jewish Week here. An American student visits Syrians being treated in an Israeli hospital. Syria; one word, five letters. The word itself is so imperceptibly simple, and still so incredibly significant. It is the name of a relatively small Middle Eastern nation plagued by conflict and coinciding social cleavages, shaken by a tolling civil war, a polarizing, politicized, and painful civil war. The nation’s citizens have become both soldiers and victims in this disastrous affair. With 400,000 dead and an additional 1.6 million injured, the question remains: who is there to assist the citizens of this despotic, war-torn nation? Read the full article at The Jewish Week here. Is there a future for the Two State Solution? Thursday, the Write On students began their day at the Israeli Ministry of Foreign Affairs (MFA). The 43 students had the privilege to hear first from Ron Gerstenfeld, Deputy Director of Public Affairs at the MFA. Gerstenfeld provided a history of the Boycott Divestment Sanctions (BDS) movement. He explained how the founder of the organization, Omar Barghouti, was born in Qatar and studied at Tel Aviv University. Gerstenfeld called it “hypocrisy” that Barghouti lives in Israel proper, what he calls an apartheid state. And while BDS claims to support a two-state solution, Barghouti has said otherwise, advocating for a one-state solution, explained Gerstenfeld. The speaker also offered the students ways to promote Israel’s position on campus but focused more on how to limit BDS’s effect on business. Dr. Tuvia Book is education director of Write On For Israel and author of “For The Sake Of Zion,” a curriculum of Israel studies. Tuvia Book with IDF Spokesman Peter Lerner, talking about the challenges of defending Israel's military to the international press. 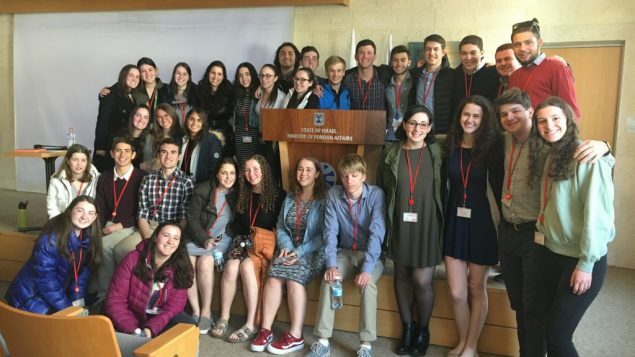 One message conveyed directly to the 42 high school seniors visiting Israel last month as part of the Write On For Israel program was that the Israel Defense Force seeks to maintain the highest moral standards. Write On, a project of The Jewish Week, is a two-year educational program for high school juniors and seniors from public, private and Jewish day schools to prepare them for the Mideast debate on campus. A highlight of the program, in which I serve as education director, is a week-long mission to Israel for seniors where they meet top Israeli journalists, government officials, military officers and a range of change makers in Israeli society, both Jews and Arabs.